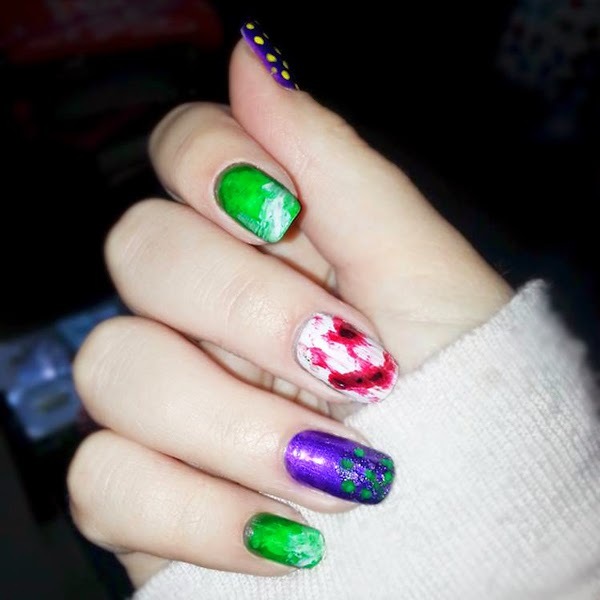 So a few days ago my friend and I decided to do a mani swap, and after a random color selection, the theme we chose was The Joker (from DC comics). 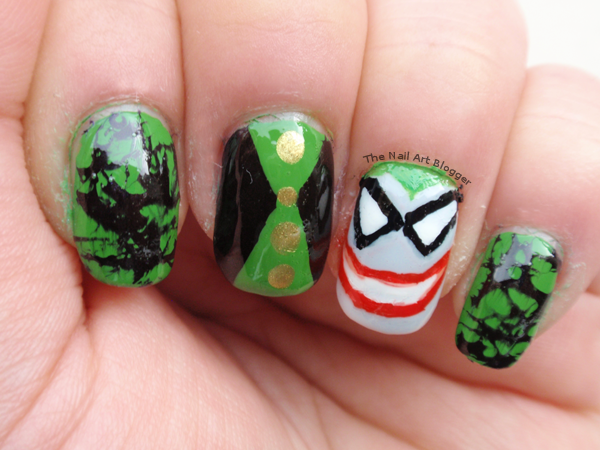 The main point was to use purple and green, and have The Joker as the theme (is it just me or did that just rhyme?) And here is what each of us came up with. 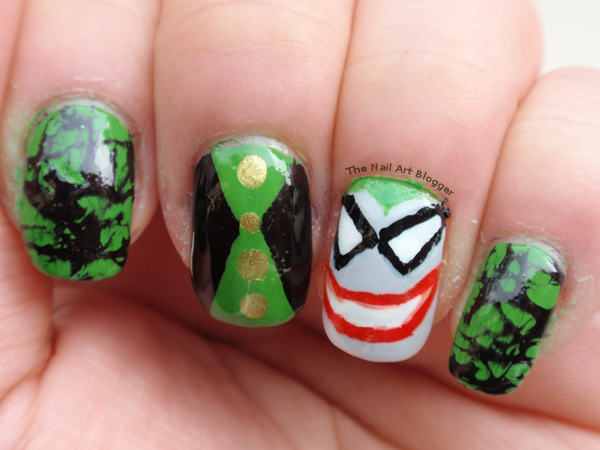 I think Semichan made an awesome use of The Joker theme on her nails. I'm loving it! Here's a couple of photos of both her hands. Make sure you check out her post about it right here. 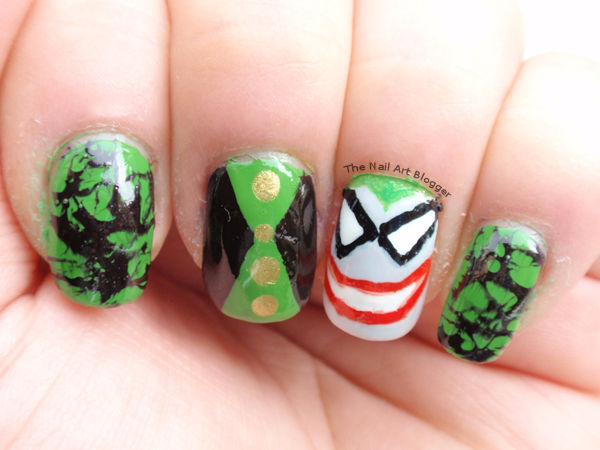 As for mine, I went a tiny bit literal on the theme and put Joker's face on my ring finger. 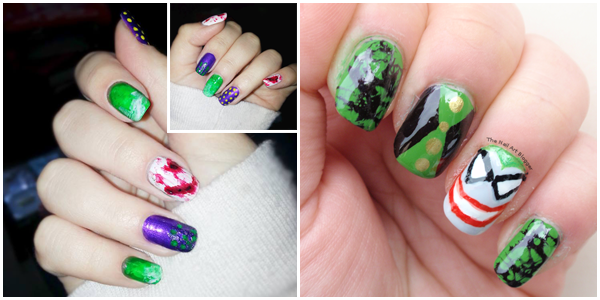 The purple I used for the index, middle, and pinky fingers ended up being too dark on top of the green. Even though in the bottle the shade is a bit lighter than that. But I do like the result of it. 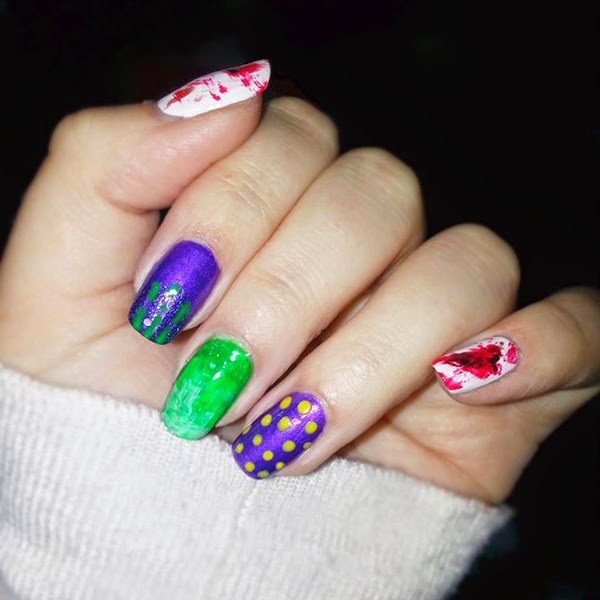 I did water spotted design on the index and the pinky; attempted Joker's suit on the middle finger, and as obvious in the photos, The Joker's face on the ring finger. Index and pinky: 298 High Line Green from NYC; 32 The Dark Knight by Catrice. 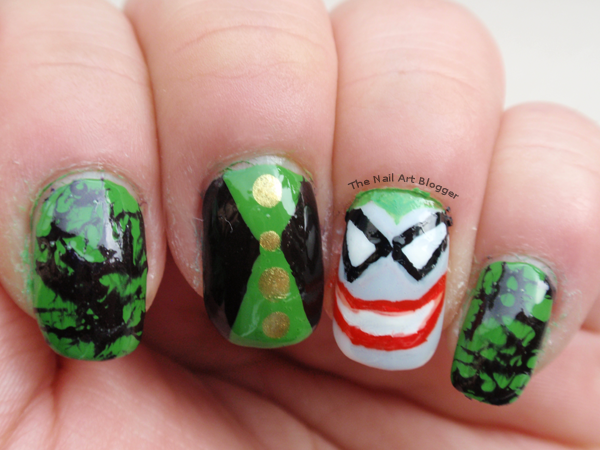 Middle finger: 298 High Line Green from NYC; 32 The Dark Knight by Catrice; 05 Wonder wow! man! from the Superheroes limited edition by Essence. Ring finger: 02 I got a crush on blue! from the Love Letters limited edition by Essence; red, black, white, and green acrylic paint. And in the end I topped it off with a layer of better than gel nails top coat by Essence. That's it for this post and if you liked this design, please let me know in the comments!